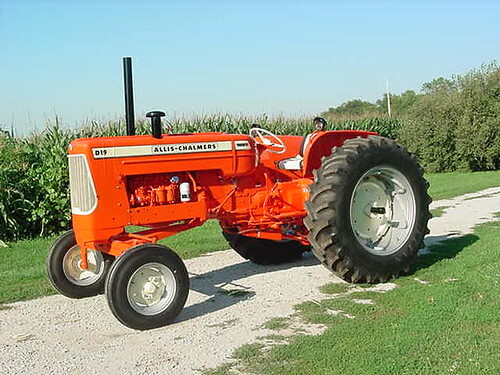 The 1961 release of the Allis Chalmers D19 provided some firsts for the company. This 6-cylinder, two-wheel drive tractor was available for purchase with three fuel options: gasoline, diesel, and propane. The propane model had the least amount of horsepower with 66.19hp, and the turbo-charged diesel came in close second with 66.92hp. The gasoline-ran model had the most horsepower at 71.54. The turbo-charged diesel model was the first tractor with a commercially produced turbo charger. Another first was the optional three-point hitch. The snap coupler hitch had previously been the norm, so sales of the three-point hitch stayed pretty low. In fact, so little of the D19s were purchased with the three-point hitch that when they are found today, then are considered a collectible. A very quiet and smooth eight-speed, sliding gear transmission and an oil lubricated high-low range hand clutch were used on the AC D19. The transmission had eight forward gears, and two reverse. This was the largest model to have used this type of transmission. Does anyone have any info on the INDUSTRIAL version of the D-19 ? I’m currently restoring a 19,and found yellow under the orange.Does the serial # designate an Industrial in any way ? How many yellow ones were produced ? Any help would be great .